Do you have irritating acne that just pops up all of a sudden? Not abundant acne but pimples once in a while? I have a great solution for you. It is called Clixit Acne Eraser and it heals acne fast with just one click. 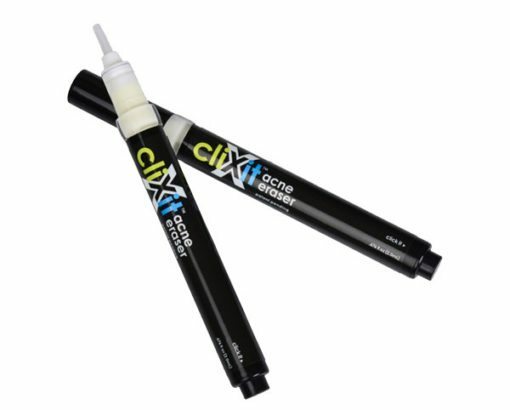 Formulated with a unique blend of healing and calming ingredients (including sulphur 10% to soothe and heal skin), this portable, discreet and unique Clixit Acne Eraser click pen works to visibly reduce inflammation and minimize the size of blemishes in 4-12 hours, while it also dries out, and heal active blemishes in 24 hours. In every pen there are about 450 applications. It also contains camphor, ethanol 40b and salicylic acid. This powerful FDA Registered formula is designed to dry out blemishes, promote quicker shedding of dead skin cells, dissolve excess oils and unclog pores. Acne lesions don't stand a chance. Plant extracts cool and calm irritated skin while delivering anesthetic (pain relief) and antimicrobial properties to promote quick healing. These are all attainable goals that the Clixit Acne Eraser can provide for you. When used daily on the same area, it is likely that another blemish will occur in that area again. But ultimately you need to keep your skin at a better level of care. Even breaking out occasionally is telling me, an Esthetician, that you have a problem with sebum and dead skin cell control. What you need to do is increse the exfoliation of skin and possibly add a salicylic acid to your regimen to decrease oil production and also decrease cells sticking to the pore walls, causing blemishes of various kinds. For the blemishes that do occasionally crop up due to hormones, use the Clixit Acne Eraser. Clixit Acne Eraser is available online at www.clixit.com. They have a few other products available, to me the most notable are cell phone wipes. Keep your cell phone clean, it does lead to acne on the cheeks. Like Clixit on Facebook: https://www.facebook.com/ClixitSkinCare/; Follow Clixit on Twitter:@clixitskincare; Follow Clixit on Pinterest: https://www.pinterest.com/ClixitSkinCare/ and Follow Clixit on Instagram:https://www.instagram.com/clixitskincare/.